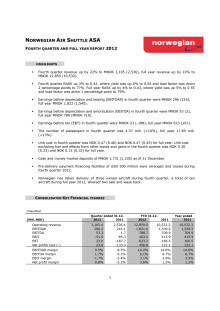 Norwegian (NAS) today reported its fourth quarter and full year results for 2012. The company reports a pre-tax profit of 623 MNOK, an improvement of 457 MNOK compared to previous year. 2012 is charaterized by solid traffic growth and international expansion with the launch of several new routes and the establishment of new operational bases. Norwegian took delivery of 13 brand-new aircraft in 2012. The company’s total fourth quarter revenues was 3.1BNOK, up 22 percent compared with the same quarter previous year. Earnings before taxes (EBT) was 23 MNOK, an improvement of 211 MNOK compared to fourth quarter 2011.The company carried 4.37 million passengers in the fourth quarter, an increase of 10 percent. The total 2012 revenue was 12.9 BNOK, up 22 percent. Norwegian carried 17.7 million passengers in 2012, up 2 million (13 percent) compared to 2011. The load factor remains 79 percent. "We are pleased with the 2012 results, particularly with an improved result of more than 200 MNOK in a quarter usually less profitable for many airlines. The load factor remains stable and the traffic growth is satisfactory,” said CEO Bjørn Kjos. “2012 was a year of international expansion and we have had necessary expenses related to the establishment of new operational bases in Thailand and Spain. These startup costs are necessary in order to grow in a global industry. Global expansion also secures Scandinavian operations and employment,” Kjos said. During 2012, Norwegian took delivery of 13 brand-new Boeing 737-800 aircraft. This year, it will take delivery of an additional 14 Boeing 737-800s and 3 Boeing 787 Dreamliners. “The fleet renewal gives Norwegian a major competitive advantage in a market where several airlines are struggling with aging fleets and high fuel costs. New, more, environmentally friendly aircraft also give our passengers a much better product, which reflects our strong passenger figures throughout 2012,” said Kjos. For more detailed information, see pdf attached. Norwegian Air Shuttle ASA, commercially branded “Norwegian,” is a public low-cost airline noted on the Oslo Stock Exchange. The company is the second largest airline in Scandinavia, and has a route portfolio that stretches across Europe into North Africa and the Middle East. In May 2013 it will even commence long-haul flights from Scandinavia to the US and Asia. With competitive prices and customer friendly solutions and service, the company has experienced significant growth over the previous years. 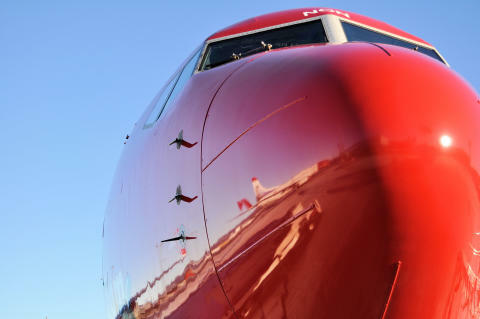 With close to 16 million passengers in 2011, Norwegian is the 3rd largest low-cost airline in Europe. Norwegian currently operates 68 aircraft on 330 routes to 120 destinations and employs approximately 2,500 people. Norwegian's fleet has an average age of 4,9 years; the company currently has 280 aircraft on order.